It was not only for Sensex that September turned out to be very bloody, even Dalal Street king’s portfolio was entangled in the dilemma. 6 stocks that lost love of Rakesh Jhunjhunwala; did he lose money? 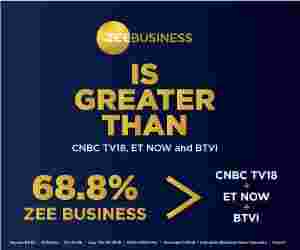 These two Rakesh Jhunjhunwala stocks surged by 5-6% today; have you invested in any? It was only second week of September, when the benchmark Sensex index was trading near 38,000-mark. However, after September 14, everything turned bleak and negative for investors when it came to have an appetite for equities. The lack of faith was massive - stocks were in bloodbath, sectors were faced with heavy selling pressure, mid caps and small caps became worst performers. Together, they contributed in denting Sensex sheen somewhat. Today, the benchmark has touched below 36,000-mark, which takes it overall down by over 2000 points in just three weeks. It was not only for Sensex that September turned out bloody, even the Dalal Street king’s portfolio was affected badly. Few of Jhunjhunwala’s stocks were having a nervous breakdown on the back of rumors. Almost every stocks where the ace investor has stored its money has given him negative performance in one months time. The quantum of loss is hefty for the "Warren Buffett of India". 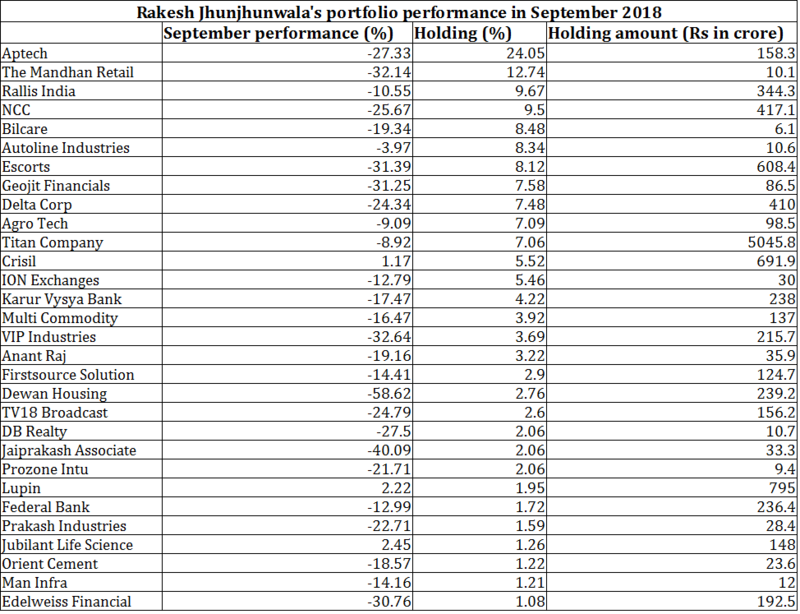 Here’s how Jhunjhunwala’s stocks have performed in September month, as per Trendlyne.com data. Dewan Housing has emerged as worst performer for Jhunjhunwala after the controversies fueled in regards to repayment of financial obligations and bonds. The company has plunged by 58.62% in one month. Second to join Dewan would be Jaiprakash Associates where recently Jhunjhunwala hiked his holding. The company has slumped by 40.09%. There were four stocks of Jhunjhunwala namely VIP Industries, The Mandhana Retail, Escorts and Geojit Financial that plunged in the range of 31% to 33%. Meanwhile stocks like, Edelweiss, DB Realty, Aptech and NCC gave away between 25% to 31%. Moreover, about Jhunjhunwala’s other 13 stocks like ION Exchange, Federal Bank, Man Infraconstruction, Firstsource Solution, Karur Vysya Bank, Orient Cement, Anant Raj, Bilcare, Prozone Intu, Prakash Industries, Delta Corp and TV18 Broadcast slipped in the range of 11% to 25%. Four stocks including favorite company Titan were in the list of losers that tumbled between 3% to nearly 11%. Only three stocks involving Jubilant Life Science, Lupin and Crisil were the ones to gain, however, the rise was single-digit in the range of 1% to 2%. With such a long experience, for Jhunjhunwala making money from stock exchanges is seemingly, like a child's play. However, it should also be known, that he has mastered the word patience in stock market. That is a virtue that everyone in stock markets needs plenty of.